Thomas Jefferson’s Pavilion III will soon look more like Thomas Jefferson’s Pavilion III. 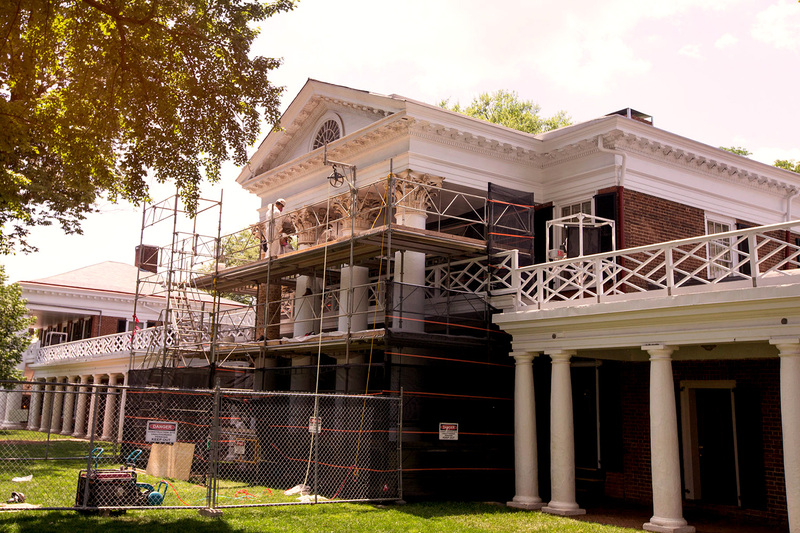 Crews have begun renovating the faculty residence in University of Virginia’s Academical Village, work that will include cleaning the capitals, replicating the first roof and restoring an original design element – a balustrade on the roof. The mahogany balustrade – essentially, a decorative railing – will run the length of the roof, and will be about three feet high. Zehmer said the original balustrade, which was probably made of heart pine, was removed sometime the last quarter of the 19th century. “We don’t know exactly why it was taken down, but most likely it had deteriorated and was causing damage to the roof,” Zehmer said. University officials do not know why the railing was not replaced when it was removed, but Zehmer said the piece was part of Jefferson’s original design. Jefferson’s original drawings and accounting memos, and historic photographs, bolster the physical evidence under the pavilion’s roof and in the attic that Jefferson had a balustrade installed on the roof. The University hired Mesick, Cohen, Wilson, Baker Architects of Albany, New York, to design the replication of the balustrade. The firm has experts in Jeffersonian architecture and experience in designing the balustrade restoration at Jefferson’s home at Monticello, which bears many similarities to the balustrade at Pavilion III. The architects scanned the roof, attic and exterior of the building, then aligned their scans with historic photographs to accurately proportion the design for the missing feature. Restoring the balustrade is part of a complete roof replacement for the pavilion. 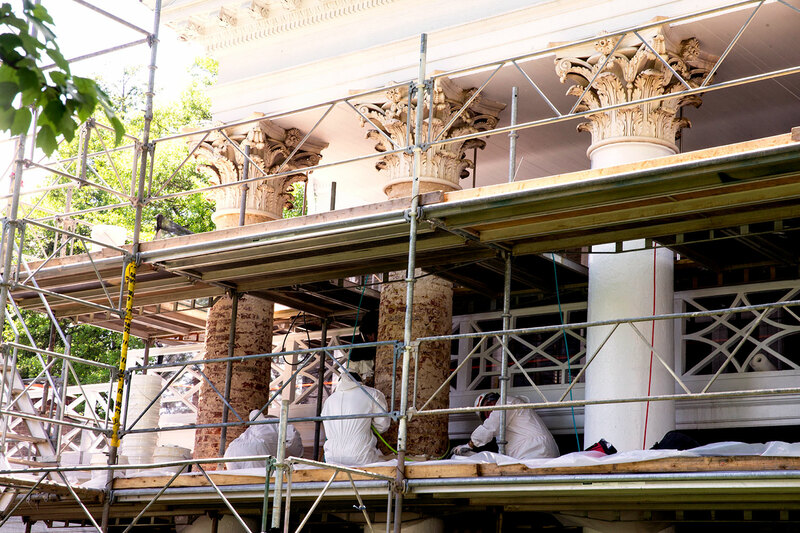 At the same time, Material Conservation Co. Inc. of Philadelphia will clean and repair the pavilion’s 1820s-era Carrara marble capitals and bases. Carr said they will examine each capital to determine what it needs, especially underside areas not washed by the rain, where pollutants may accumulate and bond with the marble. Carr’s firm has worked on several buildings on the Lawn, including Pavilions II and X and Old Cabell Hall. Leigh Hassler, a 2000 graduate of UVA’s School of Architecture, will lead Material Conservation’s team, Carr said. Crews also will renovate the pavilion’s kitchen and bathrooms , Zehmer said. The interior work will be completed in the summer and the exterior work will extend into the fall.